1. Don’t homeschool unless you and your spouse are both on board. Do proceed if both parents are unified and at peace with the decision! 2. Don’t wait to have all your ducks in a row until you start. 3. Don’t pattern your homeschool after public school. Do make learning an adventure. 4. Don’t forget the laws of your state. Do follow the requirements set before you and be thankful for this amazing opportunity! Do realize you already know a lot . . . and you have tons of resources at your fingertips (i.e. the Internet, the library, your friends/peers). 6. Don’t feel like you need to know everything. 7. Don’t focus on teaching subjects. Do remember you’re teaching your child. Seek your child’s heart and nourish his or her skills. 8. Don’t get too stuck in a boxed curriculum. Do find ways to make learning come to life! Do get plugged in with local homeschooling groups and friends. 10. 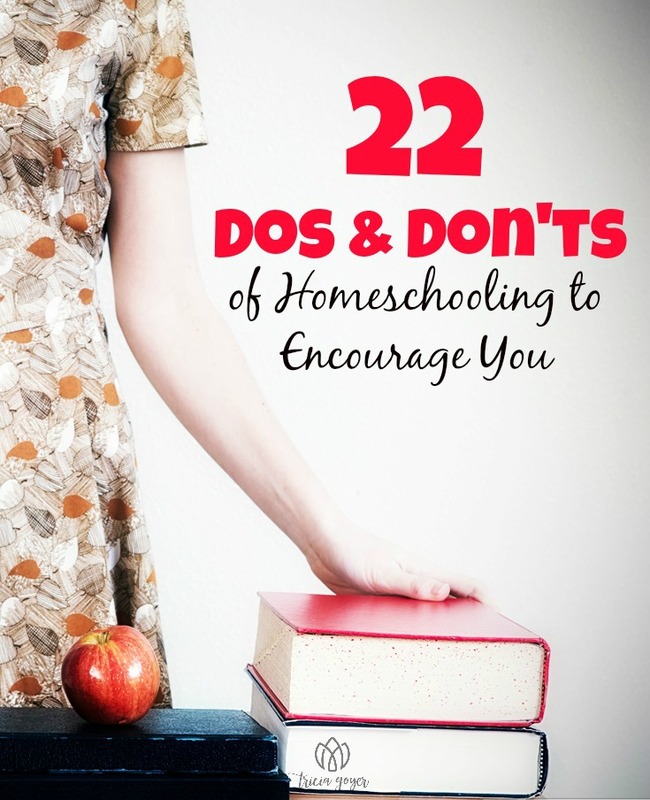 Don’t worry about what’s popular with other homeschoolers. Do follow your child’s unique interest and learning styles. 11. Don’t make “finishing the work” your goal for each day. 12. Don’t think of book work as a complete education. Do incorporate real-life learning: volunteering, home ec, and life skills. 13. Don’t glue yourself to the kitchen table. Do explore your community through classes, museums, and events. 14. Don’t let one bad week (or bad month) discourage you. Do remember that every good thing is hard at times. 15. Don’t judge on outward accomplishments only. Do focus on your children’s inner qualities. 16. Don’t worry about all your kids are missing out on in public or private schools. Do rejoice in all the opportunities open to them. 17. Don’t feel you have to give up all your God-given goals and dreams to homeschool your kids. Do know that your kids will learn how to follow God as they see you do it. 18. Don’t judge your success by testing or grades. Do know that the greatest reward will be the relationships your child builds with you, other family members, and with God. 19. Don’t think it’s all about the kids. Do know God will grow and change you as you school your kids. 20. Don’t be surprised to have a few really bad days. Do celebrate the really good ones. 21. Don’t think you have to figure it out on your own. Do seek advice from veteran homeschoolers. 22. Do be thankful for all the negative influence that your children are missing out on. And don’t underestimate the influence for God’s kingdom through living, serving, and learning together. For more help with balancing homeschooling and following your God-given dreams check out Balanced and Homeschool Basics. I so wish that there had been someone like you when I started homeschooling in the 1980’s. When I first started I didn’t know another soul who homeschooled, I just knew that for my children there was no other way. Shortly thereafter I met a small handful of other homeschoolers. Now it seems like there are so many sources out there to help anyone interested in homeschooling no matter why they made the choice. I am so glad that the support is out there for those who make this choice. I have often said that homeschooling my children was the hardest, best job that I ever had. With the most far-reaching results. Blessing to all of you who pursue this course. Shirley, I was in the 4th grade in 1980 … but I remember a friend who was homeschooled! I thought it was crazy … but look at me! Thank you for paving the way for so many! Keep on encouraging those newbies out there! You are a blessing.